Thai gastrobar Chalawan delivers an impeccable menu of contemporary Thai food and drink. The ambience is modern and relaxed. 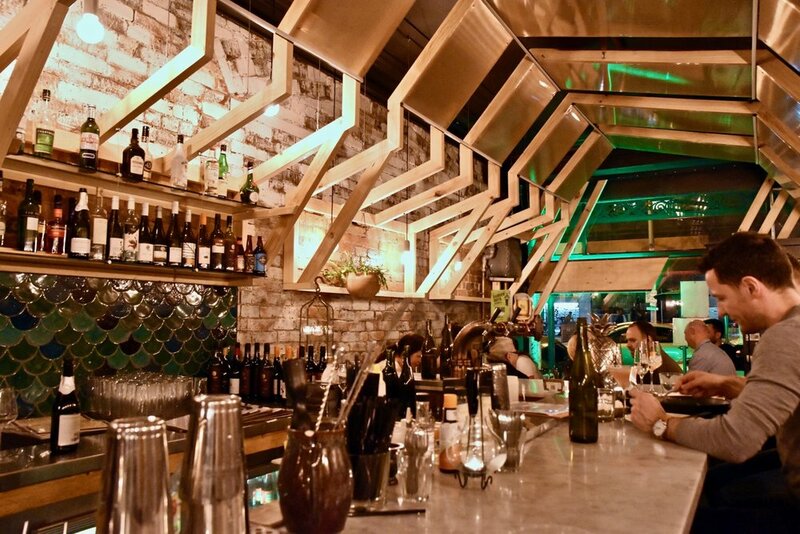 Designed by Studio Equator, the beautiful space is anchored by the reptilian central bar covered in scale-shaped turquoise tiles, while the vaulted exposed beams down the length of the dining room draw diners’ eyes to the Chalawan Crocodile King mural on the back wall. 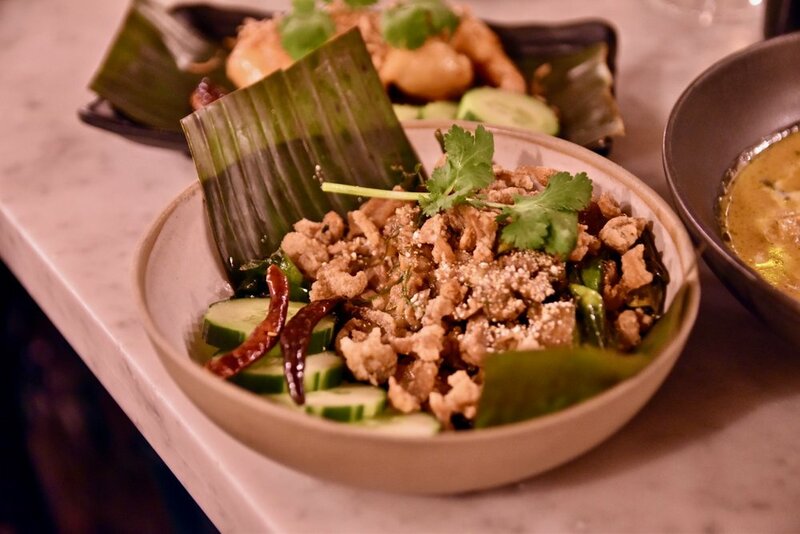 The venue runs seamless thanks to an all-star team direct from Bangkok, ensuring that all the zest, vibrancy and vigour of Thai cuisine comes through on every plate. We started with the Pla pla - kingfish, lightly smoked chili and coconut flake. The dish was a multitude of intense flavours and was highlighted on by luxuriously Kingfish which was masterfully cured to showcase its delicate texture. The Goong ma kam was equally delicious. Crispy Fried Tiger Prawns, were cooked to perfection and served with moreish Tamarind Chili Sauce. For mains we fell in love with the Gaeng poo. 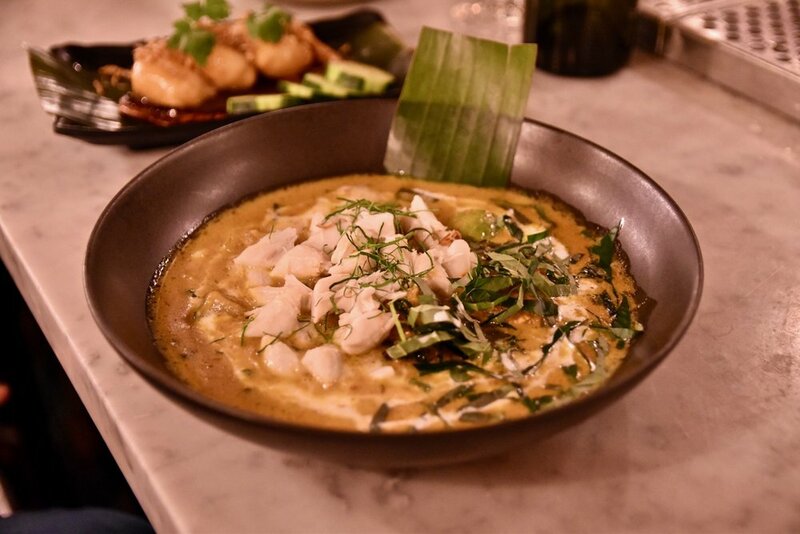 Featuring melt in your mouth morsels of beautifully cooked crab meat in a decadent and creamy southern style curry cooked in a flavour-laden mix of apricot, lemongrass, turmeric, kaffir lime, pickled fennel and chili. 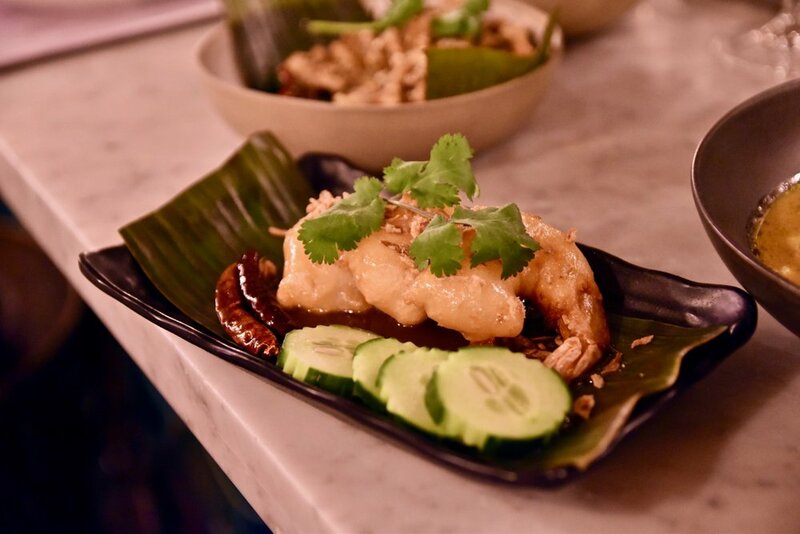 The pad thai prawn continued the trend of amazing dishes. The popular Thai stir fried noodles transported us straight to the streets of Thailand. Ribbons of rice noodles were skilfully wok tossed with tofu, bean shoots,garlic chives,king prawn ,spring onion ,peanuts ,shallots and egg in a housemade tamarind sugar sauce. Just. Yum. For a large dish perfect for sharing, the Pla lard prik is an absolute winner. Think crispy fried whole baby snapper adorned with the most amazing sweet and sour chili gravy. To match the outstanding food menu are the Thai cocktails made using premium spirits and featuring house-dehydrated fruit. The cocktail menu features an exquisite list of drinks which will take guests straight to the streets of Bangkok. A highlight is the Gondola which is made from a heady mix of Vodka, housemade ginger syrup, organic ginger powder and citrus. With a menu grounded in authentic thai flavours paired with modern techniques, local produce and ingredients, Chalawan pleases with a sophisticated and interesting menu unlike any other Thai offering in Melbourne.